Emeritus Bishop of Townsville, Reverend Raymond Benjamin, passed away on Monday, 7th March 2016. Fr. Michael Lowcock, Diocesan Administrator of the Diocese of Townsville, informed the Catholic community and beyond. Bishop Benjamin turned 91 on the 24th of February this year. He was born in Rockhampton in 1925 and was educated at Our Lady’s Infant School and later at the Christian Brothers College, West Rockhampton. After completing his training at the Pius XII Provincial Seminary in Brisbane, he was ordained by the Most Rev. Andrew Tynan, Bishop of Rockhampton on the 25th of July, 1949. 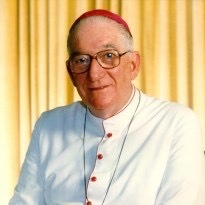 As a Priest, he served in many parishes in the Diocese between 1950 and 1984 when he was elected as Fourth Bishop of Townsville on the 14th of February 1984. Bishop Benjamin was consecrated as Bishop of Townsville on the 9th of May at an outdoor Ordination at the Dean Park Soundshell by Most Rev. Francis Rush, Archbishop of Brisbane. The Diocese of Townsville will be live streaming the Vigil and Funeral for Bishop Benjamin. Both services will be available on the following links. Diocesan Administrator Fr Mick Lowcock said “Bishop Ray came as a real pastor of this Diocese, he was open to new directions for the Diocese and was willing to support the parishes in many new directions.” “In some ways he was a leader before his times,” Fr Mick said. 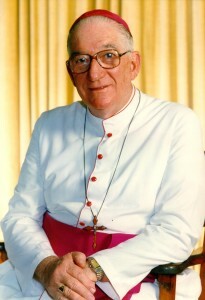 Bishop Benjamin submitted his resignation to the Holy Father on the 1st of February 2000 and it was accepted on the 18th of April. He was then directly appointed as Apostolic Administrator of the Diocese until the 24th of January 2001 when Bishop Michael Putney was appointed as 5th Bishop of Townsville. “Many saw him as a wise and loving Bishop. He was a good preacher, a great story teller and loved Townsville after coming from Rockhampton Diocese where he served in many country parishes – Mount Morgan, Tambo, Yeppoon,” Fr Mick said. Bishop Benjamin’s family were well known in Rockhampton and his only surviving sibling, Bernie, married to Jill, is still in Rockhampton. He was fond of his family and travelled overseas for their weddings and others occasions. Since his retirement to Brisbane as Emeritus Bishop of Townsville, he has kept a keen interest in the Diocese even though his health has declined. He has been in Marycrest Hostel for the last few years and kept alive his love of music there. He was deeply involved in life there and was a welcome addition to their choir. His Welsh heritage was dear to him and in later year he revived his love of playing the cello. The funeral will be held at the Sacred Heart Cathedral in Townsville on Thursday 17th March commencing at 11am. A Vigil service will be held on the Wednesday evening commencing at 7pm. This entry was posted in Uncategorized on March 15, 2016 by ACBC Communications.